Barry Clifford loves bringing history to life. Having devoted his professional life to diving and underwater exploration, Barry has discovered numerous shipwrecks off Cape Cod, Madagascar, and throughout the Caribbean. But of all Clifford’s discoveries and salvages, his most cherished is the Whydah Gally—the legendary pirate ship of his boyhood daydreams. He made international headlines in 1984 when he and his team of divers and archaeologists discovered the remains of Captain “Black Sam” Bellamy’s flagship just of the coast of Wellfleet, Massachusetts. After the Whydah’s discovery, Barry dedicated his efforts to excavating, conversing, and displaying these priceless historical artifacts for the world to see. Artifacts from the Whydah have been featured in exhibits all over North America, in Scotland, Germany, and locally in museums in Provincetown and Yarmouth. Clifford has authored several books and appeared in numerous documentaries on the Golden Age of Piracy and undersea exploration. 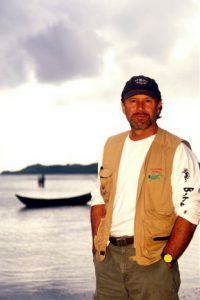 He is a fellow of the Explorers’ Club, an honorary member of The Boston Marine Society, a 2005 recipient of the Rolex-Lowell Thomas Award, a 2006 Explorer-in-Residence at American Museum of Natural History in New York, and was recently recognized with the “Bringing History to Life” award by the Chatham Historical Society in 2017. After more than three decades of recovery, Barry remains just as passionate about the Whydah as he was the day he discovered her. He visits the museum frequently and enjoys sharing his knowledge and stories of his adventures with guests.